Why have your soil tested? Who can benefit from soil testing? When should I test my soil? How to send in a soil sample? What is a soil test collection kit (mailer)? What questionnaire should I fill out? How soon will I receive my results? Can the lab test for soil contaminants? Who can I contact for plant, insect, weed or disease related questions? I tested my soil with a home kit or sent my soil to a different lab, why are the results different? Soil testing takes the guesswork out of maintaining the soil in optimum condition for plant growth and development. Different plants have different soil pH and nutrient requirements. Testing is inexpensive when compared to investments in your plants, amendments, time and efforts. The fertilizer guidelines provided with the soil test results are based on environmentally-friendly soil fertility management practices. A soil test will assess the present levels of major plant nutrients, soil pH, micronutrients and provide an estimate of total soil lead. Recommendations will include the amounts of limestone and fertilizer, if necessary, to meet the requirements of the specific plant or crop being grown. If elevated soil lead levels are indicated, appropriate information will be included with your results to address this problem. A. Standard Nutrient Analysis – This test is suitable for most purposes. Samples are analyzed for soil pH, macro and micro nutrients, and estimated total soil lead. Soils are hand-textured and a visual estimate of the organic matter content is made. Limestone and fertilizer recommendations are made based on results. B. Soil pH Only – Soil pH levels are measured and a limestone or sulfur recommendation is made if necessary. Soil pH is included in the Standard Nutrient Analysis. C. Soil Organic Matter – The percentage of organic matter is determined by a procedure called loss on ignition. Interpretation is provided but recommendations are not made. D. Soil Textural Analysis – The actual percent of sand, silt, and clay is determined and the soil is categorized using USDA classification. No recommendations are given. E. Soluble Salts – This test measures the amount of total soluble salts by electrical conductivity. An interpretation is provided. F. Saturated Media Analysis – This test is provided for soilless potting media only. It is not appropriate for mineral garden soils. Results include macro and micronutrients, soluble salts, media pH, and nitrate-N and ammonium-N levels. G. Nitrate Testing – The lab offers agronomic and commercial vegetable growers a Pre-sidedress Soil Nitrate Test (PSNT) from June 1st to August 15th and a Cornstalk Tissue Test in the fall and winter. When/how often should I test my soil? Samples can be collected any time of year that the ground is not frozen. Many people collect their samples for testing in the spring right before planting, but fall is an optimal time especially if a soil pH problem is suspected. Amendments such as limestone or sulfur can be added in the fall as can slow release, natural organic sources of phosphorus and potassium. This allows sufficient time for reactions to occur in the soil so the pH and fertility should be at or close to the target levels by spring. A soil test should be performed about every three years to monitor soil pH and fertility levels. However, if a large correction in soil pH or fertility is called for by the initial soil test, it is a good idea to retest one year after amendments or fertilizer additions to evaluate if the situation has been corrected. How do I send a sample? Each sample is labeled (if more than one is sent) both on the bag and on the questionnaire. The appropriate questionnaire(s) is filled out. A check or money order (made payable to UConn) is included. Packages are mailed to: UConn Soil Nutrient Analysis Laboratory, 6 Sherman Place, U-5102, Storrs, CT 06269. Each soil test collection kit (sometimes referred to as the soil test mailer) contains a questionnaire, sampling directions, and a plastic bag for one soil sample. These fit into the mailing envelop which is addressed to the Soil Nutrient Analysis Laboratory. It is not necessary to send soils to us in these kits although some people like the convenience of having all the collection materials provided to them. These collection kits are pre-paid meaning the cost of the analysis is paid for when the kits are purchased. The cost of mailing is not, so postage is required. Pre-Paid Soil Test Collection Kits can be purchased at the Soil Nutrient Analysis Lab, the Home and Garden Education Center, and some of the Cooperative Extension Centers. Some garden centers also sell them. Soils sent in these kits receive the Standard Nutrient Analysis. The questionnaire filled out depends on the crop and the type of grower. Home grounds/Landscape is used by homeowners, gardeners, lawn care companies, landscapers, contractors, and landscape architects. Crops include: lawn, vegetables, flowers, shrubs, trees, groundcovers, and small fruits. Recommendations are given in pounds per 1000 (or 100) square feet. When a "home grounds/landscape" client has specific problems, a copy of the soil test results and their question is sent to the UConn Home & Garden Education Center for further assistance. Agronomic Growers produce crops that will be used for animal feed, including silage corn, hay, small grains, wildlife food plots, warm season grasses and grazing pastures. The questionnaire for this group contains questions related to manure history, field size, and yield goal. When a grower has specific problems, they are directed to a specialist for further assistance. Recommendations are provided on a per acre basis. Commercial Growers produce crops that will be sold for human use or consumption including fruits, vegetables, field grown cut-flowers, and Christmas trees. Questionnaires developed for this group of people ask specific questions that allow the lab or the Extension Specialist to make site/situation-specific recommendations. Commercial growers are directed to the Extension Specialist if further assistance is required. Recommendations for field crops are generally provided on a per acre basis. Additional Soil Tests: Use the additional soil test form if requesting percent organic matter, soil textural analysis, soluble salts, or soil pH only. The typical turn-around-time for results is 3 to 4 business days from time of sample receipt except during April and May when it may take 1 to 2 weeks due to heavy sample load. Pre-Sidedress Soil Nitrate Tests (PSNT) are done on a 24-hour turn-around (next business day) from June 1st through mid-August. The UConn Soil Nutrient Analysis Laboratory routinely screens samples which are submitted for the standard nutrient analysis for estimated total soil lead. We also analyze for available copper and zinc. If determination of other heavy metals or organic contaminants such as pesticides, PCBï¿½s, petroleum based products, etc. is required, turn to the numerous environmental testing labs in the state of Connecticut. Look up ï¿½Environmental Testing Laboratoriesï¿½ in the yellow pages to find a lab near you. Also, you can follow this link to the State of Connecticutï¿½s Department of Public Health website for a list of state approved environmental testing labs. Keep in mind that there are tens of thousands of different substances in the environment but no single test that will screen for all of them. A laboratory needs to know what substance(s) to look for. Sometimes site history will suggest what analyses to request. Who can I contact for specific plant related questions? Questions can be referred to the UConn Home and Garden Education Center in Storrs by calling the toll-free (877) 486-6271. Also our eight local County Cooperative Extension Centers plus the Bartlett Arboretum in Stamford are staffed at various times by Master Gardener Coordinators and Master Gardener volunteers to answer your plant, insect, disease and weed questions. The University also has specialists that can help with a variety of different issues. Below is a list of faculty and staff with their areas of expertise. I have a weed, insect, or plant disease that I want identified. Can you help? For the identification of a weed, insect, or plant disease, please see the Home & Garden Education Center’s website. The Center supports a Plant Diagnostic Laboratory. Call (877) 486-6271 (toll-free) or visit www.ladybug.uconn.edu to find out how to submit a sample and the fee schedule. You can also visit or call your county Extension Center for sample diagnosis. I tested my soil with a home kit or sent my soil to a different lab; why are the results different? There are many different ways of testing soil for fertility. What they all have in common, is that they index the extractable nutrients into categories such as below optimum, optimum and above optimum. At UConn, for example, these categories have been established for individual crops over the past century through field studies using the Modified Morgan Extractant. A laboratory that uses a different extraction solution (like Mehlich or Bray) will extract different amounts of nutrients. Therefore, they will come up with different values for each nutrient. Home test kits work under a similar premise. The bottom line is that even if the numbers on the soil test reports differ; the categories and recommendations should be similar. It is also important to note that different extractants are used based on soil physical and chemical properties. The Modified Morgan extractant has been designed for soils in the northeastern United States. Soil characteristics vary from region to region. While the lab will test any soil that is submitted to us, our recommendations may not be appropriate for soils obtained outside of this area. If you live outside of New England and are interested in having your soil tested for fertility, contact your local Cooperative Extension Office for information about soil testing in your area. Organic Matter plays a vital role in maintaining a healthy soil. 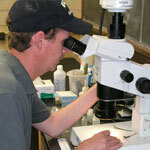 Our lab can analyze your soil and determine the percent Organic Matter it contains. Excessive or ill-timed fertilizer applications can contribute to ground and surface water pollution, may inhibit plant growth, and can be a waste of time and money. A soilï¿½s pH affects the availability of all plant nutrients. A handful of soil may contain more than a billion microorganisms. At least 16 and maybe more, nutrients are essential for plant growth.